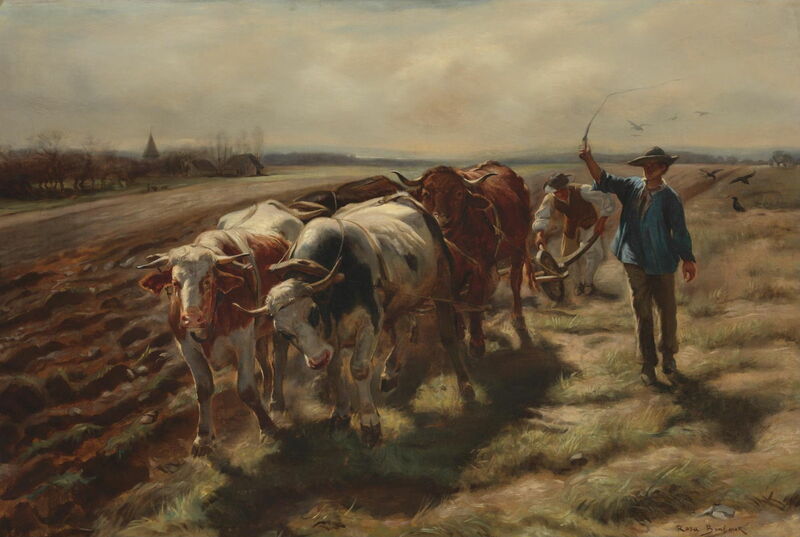 Rosa Bonheur (1822–1899), Oxen Ploughing (1875), oil on canvas, 68.6 × 101.6 cm, Private collection. Wikimedia Commons. No accounts of the painting of animals, nor of French painting in the nineteenth century, can omit one of the most famous animalières of all, and one of the leading women painters, Rosa Bonheur (1822–1899). Born as Marie-Rosalie Bonheur in Bordeaux, her father and uncles were established painters and sculptors, and believed in the education of girls alongside boys. The family moved to Paris when she was a child, and she quickly showed herself to be enthusiastic in drawing. Her childhood was tumultuous, though, because of her disruptive behaviour and resulting expulsions from schools. She started an apprenticeship as a seamstress, but at the age of twelve her father finally had to accept that she could only train as a painter. She proved a precocious student, starting to copy paintings in the Louvre when she was only fourteen, where she first encountered the animal paintings of Paulus Potter, and others. She dissected animals and studied their anatomy at the National Veterinary Institute in Paris, to train further for her chosen specialty of painting animals. She had her first work accepted for the Salon in 1841, before she was even twenty: it showed two rabbits, and in 1845 she was awarded a third-class medal. She also started making sculptures in the early 1840s, with some fine bronzes of sheep dating from 1842, and cattle from 1846, for example. 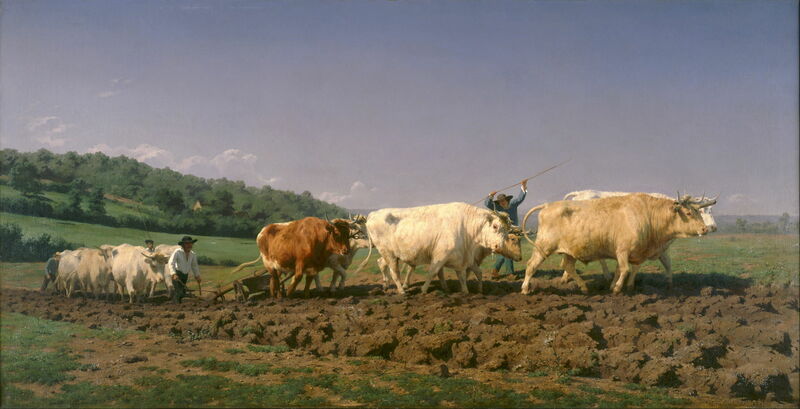 Rosa Bonheur (1822–1899), Ploughing in Nevers (1849), oil on canvas, 134 x 260 cm, Musée d’Orsay, Paris. Wikimedia Commons. Ploughing in Nevers (1849) was her first major success, a government commission and exhibited in the Salon that year. Ploughing was one of her favourite themes of her early career. Faithful depiction of the teams of oxen is demanding on anatomical knowledge, and here incorporates fine landscape with rich colours and textures. Ploughing is also one of the most fundamental agricultural tasks, with extensive symbolism, including the combined teamwork of the ploughman and animals. Rosa Bonheur (1822–1899), A Herdsman with his Flock (1852), oil on canvas, 65.4 × 82 cm, Private collection. Wikimedia Commons. 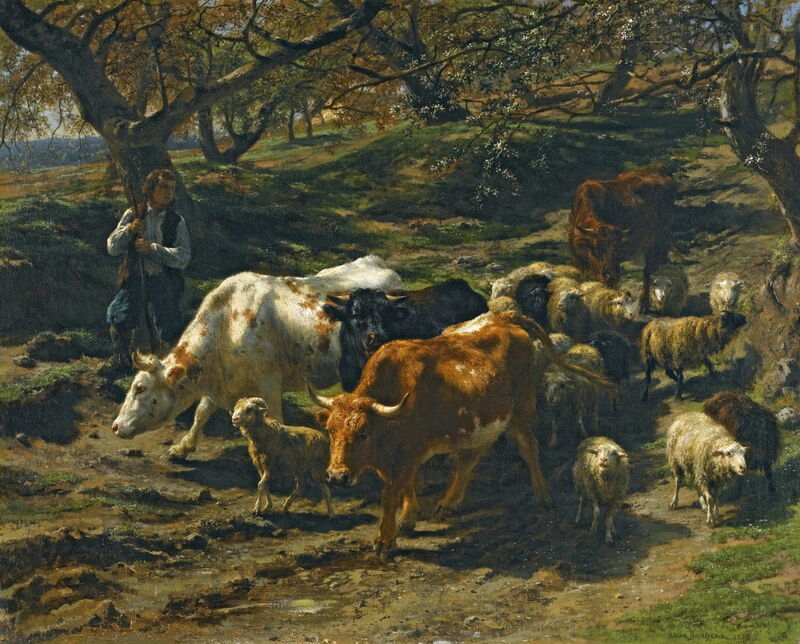 A Herdsman with his Flock (1852) gave her the opportunity to show a wider range of animals typical of a small farm, to explore the wonderful dappled light, and to paint an open woodland setting. 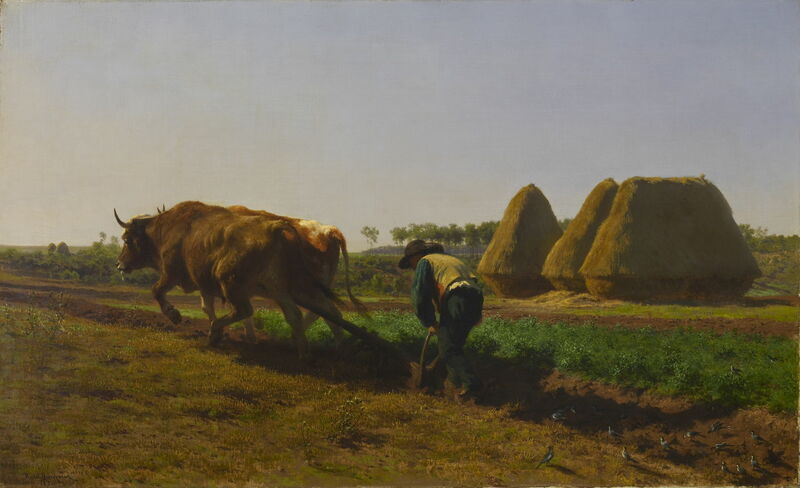 Rosa Bonheur (1822–1899), Ploughing Scene (1854), oil on canvas, 49.5 cm x 80.5 cm, Walters Art Museum, Baltimore, MD. Wikimedia Commons. In her Ploughing Scene (1854), the animals are less dominant, and she strikes a balance in favour of the landscape as a whole, with its vertiginous haystacks, and the land itself. Rosa Bonheur (1822–1899), The Horse Fair (1852-55), oil on canvas, 244.5 × 506.7 cm, The Metropolitan Museum of Art, New York, NY. Wikimedia Commons. The Horse Fair (1852-55) is now probably her most famous painting, and was a great success when first exhibited in London in 1854. The market is set in Paris – perhaps a surprising location today, but still with very rural areas at the time. The line of trees marks the Boulevard de l’Hôpital, and in the distance is the distinctive dome of La Salpêtrière. By 1855, Bonheur had achieved international fame, and was even more celebrated in the UK than in her native France. She travelled to Scotland, meeting Queen Victoria during her travels; the Queen (who was a keen amateur watercolourist and loved animal paintings) already admired Bonheur’s work. When in Scotland she sketched and made studies for several paintings which she completed over the following years. Her British dealer had many of her paintings engraved by Charles George Lewis (1808-1880), one of the best engravers at the time. Rosa Bonheur (1822–1899), Spanish Muleteers Crossing the Pyrenees (1857), oil on canvas, 116.8 × 200 cm, Private collection. Wikimedia Commons. 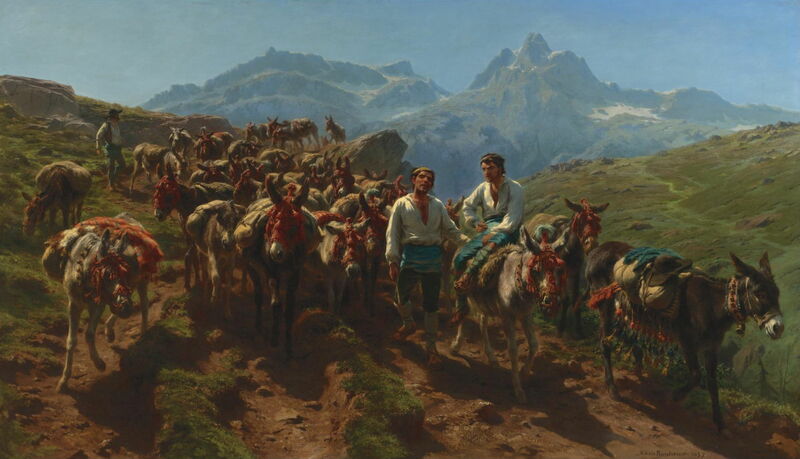 Although dominated by the mules themselves, her Spanish Muleteers Crossing the Pyrenees (1857) incorporates one of her most spectacular landscapes, some of which were painted in collaboration with her father. Mules like these were at the time an important means of trade over the Pyrenees, via traditional routes over passes which had been used by animals and humans for millenia. 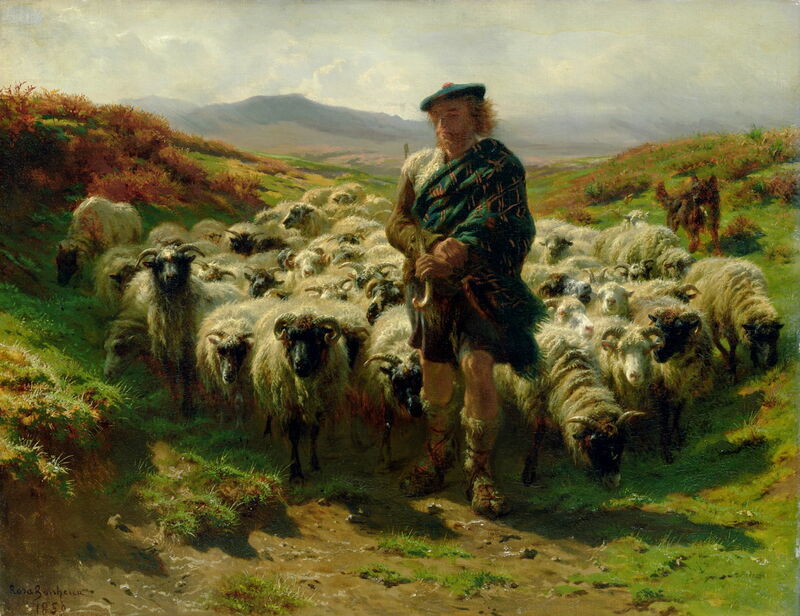 The Highland Shepherd (1859) is one of the finished paintings resulting from her 1855 visit to Scotland. At the time, the Highland Clearances had entered their final phases, and the sheep being driven here were probably the sole occupants of much of the landscape behind them. Earlier towns and villages had been emptied, their occupants evicted by largely absentee landlords, over the previous two centuries. In 1860, Bonheur bought the Château of By, in the village of Thomery, near Barbizon, the spiritual home of the Barbizon School. She apparently kept various domestic and more exotic animals there, some of which she painted. 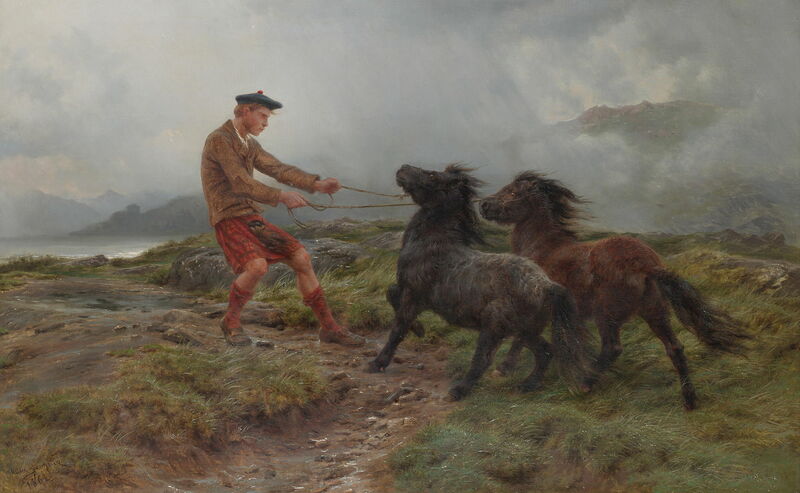 A Ghillie and Two Shetland Ponies in a Misty Landscape (1861) was another of the finished paintings which she made from her visit to Scotland. 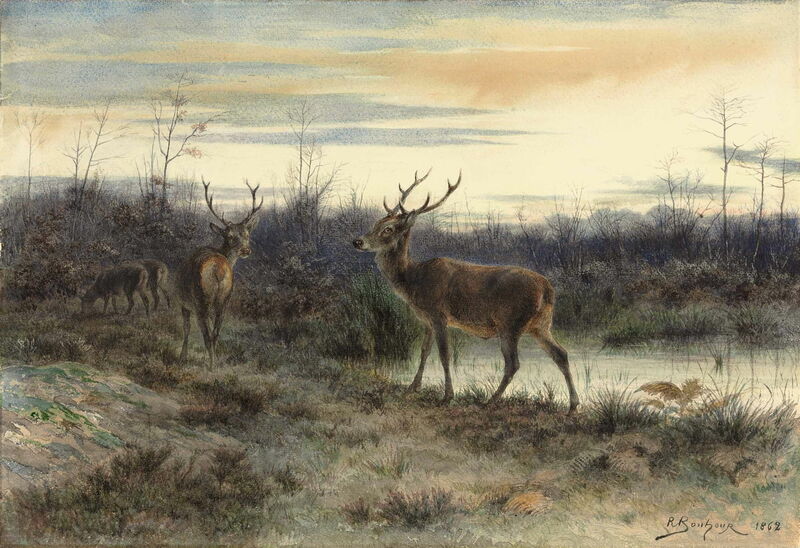 Rosa Bonheur (1822–1899), Deer in the Forest of Fontainebleau (1862), pencil, watercolor and gum arabic, 34.4 × 50 cm. Private collection. Wikimedia Commons. Bonheur also painted some fine watercolours, including her Deer in the Forest of Fontainebleau (1862), set not far from her home. In 1865 she was admitted to the Legion of Honour. Rosa Bonheur (1822–1899), The Wounded Eagle (c 1870), oil on canvas, 147.6 x 114.6 cm, Los Angeles County Museum of Art, Los Angeles, CA. Wikimedia Commons. 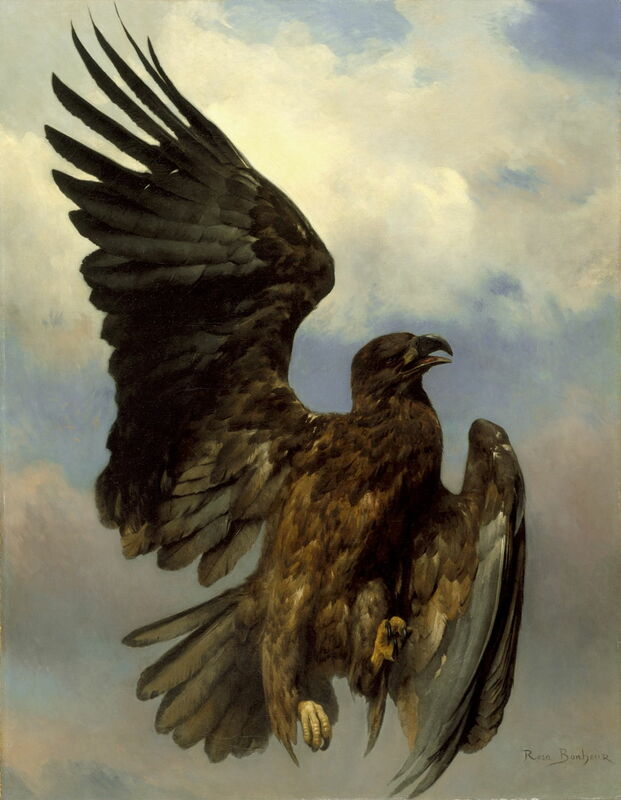 The Wounded Eagle (c 1870) was not her first painting of a bird: one of her earliest oil paintings, probably from around 1842, shows four pigeons. However, birds of prey were perhaps more appropriate for her later career. Her later paintings, such as Oxen Ploughing (1875), became slightly looser in brushwork, particularly in vegetation and the background landscape, in response to the influence of Impressionism. Rosa Bonheur (1822–1899), Weaning the Calves (1879), oil on canvas, 65.1 × 81.3 cm, The Metropolitan Museum of Art, New York, NY. Wikimedia Commons. 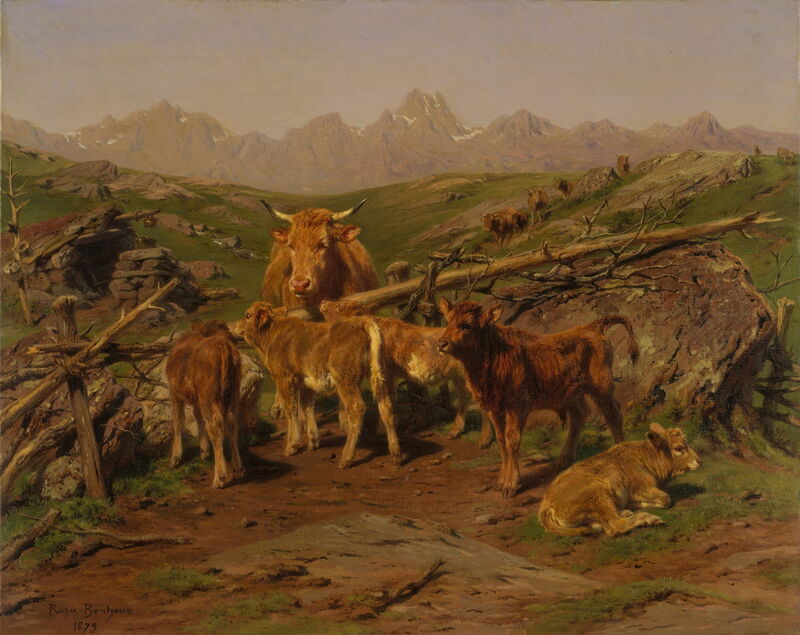 Her Weaning the Calves (1879) is set in a glorious summer Alpine or Pyrenean landscape, with a dry stone herdsman’s hut at the left. Herdsmen in those mountainous areas lived away from their families, in the mountain grazing lands, for the summer season, with their herds and flocks – the transhumance, a separation which is still remembered by the older populations there. Rosa Bonheur (1822–1899), The King Watches (1887), watercolor on paper, 55.9 × 77.5 cm, Private collection. Wikimedia Commons. 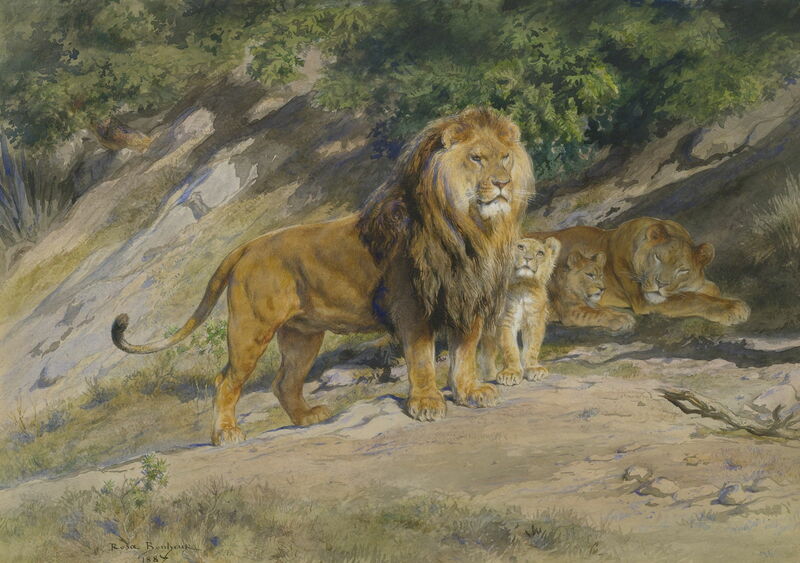 Bonheur had a preference for powerful animals, oxen with their brute strength, and lions, as in her The King Watches (1887), another outstanding watercolour. 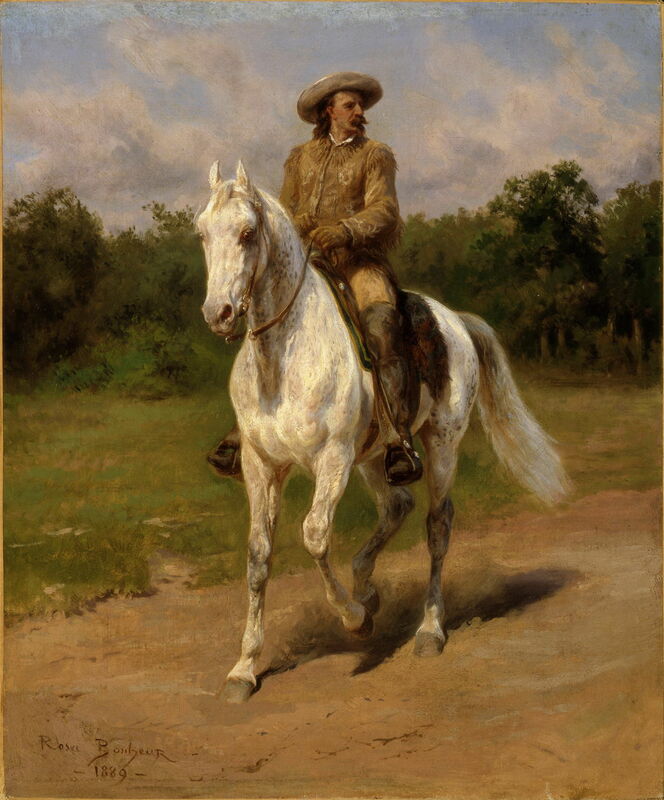 Rosa Bonheur (1822–1899), Colonel William F. Cody (Buffalo Bill) (1889), oil on canvas, 47 × 38.7 cm, Buffalo Bill Historical Center, Cody, WY. Wikimedia Commons. Colonel William F. Cody (Buffalo Bill) (1889) shows this famous showman, who toured Europe with his Wild West Exhibition. This reached Paris in 1889, and Bonheur visited the showground to sketch the American species and breeds there. She invited Cody to her château, where she painted this portrait of him. Rosa Bonheur (1822–1899), Deer and Faun in a Wood (1893), oil on canvas, 32.5 × 41 cm, Private collection. Wikimedia Commons. 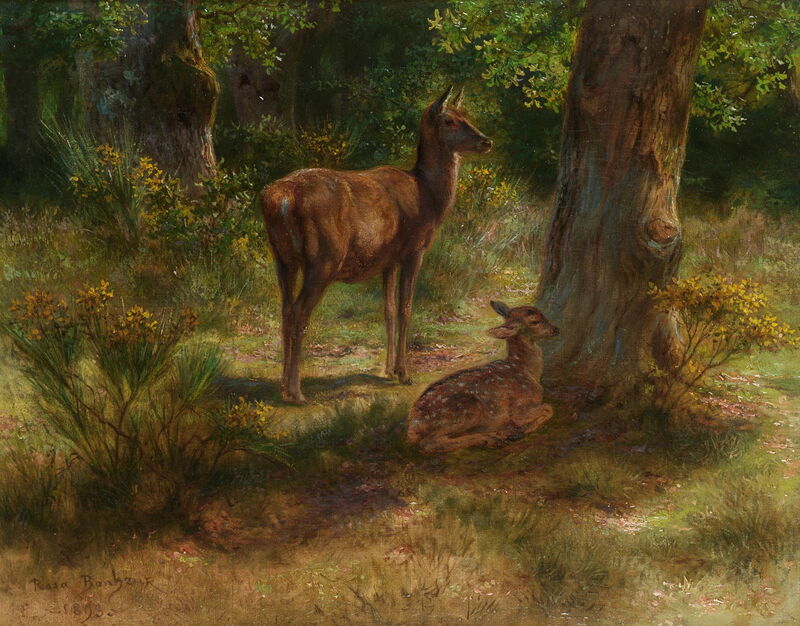 Deer and Faun in a Wood (1893) shows the fauna of the woodland near her home, using captive models. She died in the Château of By, Thomery, France, on 25 May 1899. Posted in General, Painting and tagged Barbizon, Bonheur, cattle, farming, landscape, painting, sheep, Troyon, women in art. Bookmark the permalink.